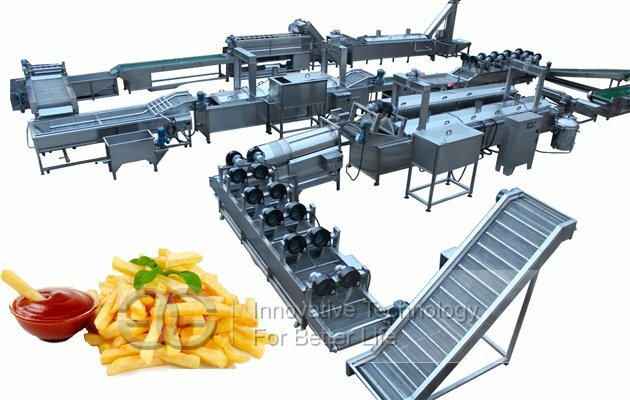 This frozen french fries processing plant is mainly used to produce potato french fries using fresh potato, it also can process frozen potato chips. 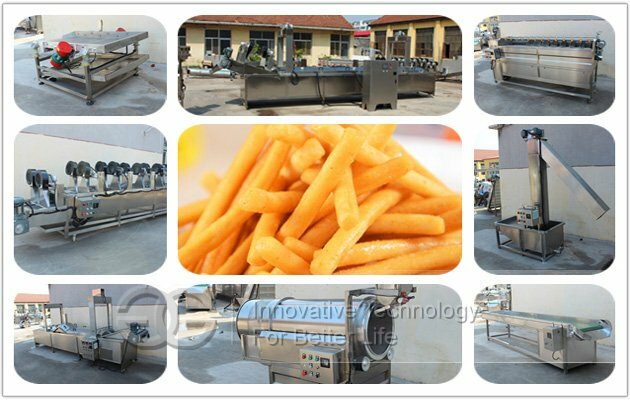 Automatic Frozen French Fries Machinhe|Cassava Potato Sticks Processing Plant is mainly used to produce potato french fries using fresh potato, which can be used to process frozen french fries or pre-fried fries. 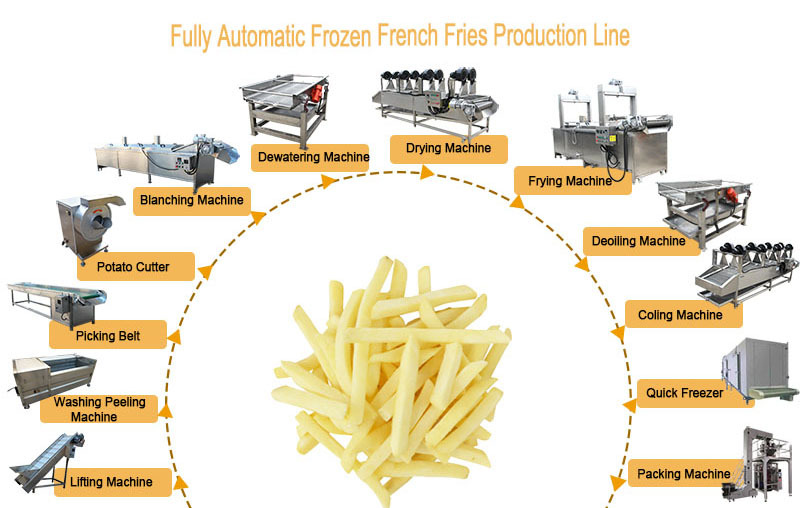 The complete french fries production line is consisted of Potato washing peeling machine, french fry cutter machine, blanching machine, air dewatering machine, french fries fryer Machine, vbrate de-oil machine, air drying machine, french fries flavoring machine and packaging machine. 1. French fries cutter machine: Commercial french fry cutter machine to cut the potato or sweet potato as think pieces and chips. 2. The automatic french fries machines are made of Stainless Steel 304. The Chips Fryer Machine is with both gas and electic heating type. 3. All bearings are stainless steel bearings, electric are made of Chint Brand or Schneider Brand. 4. For this potato finger chips making product line, it will need about 200 square meters to hold. It required the length of factory plant will not less than 58meters, the width will no less than 3m, and the height is not less than 3m. 5. 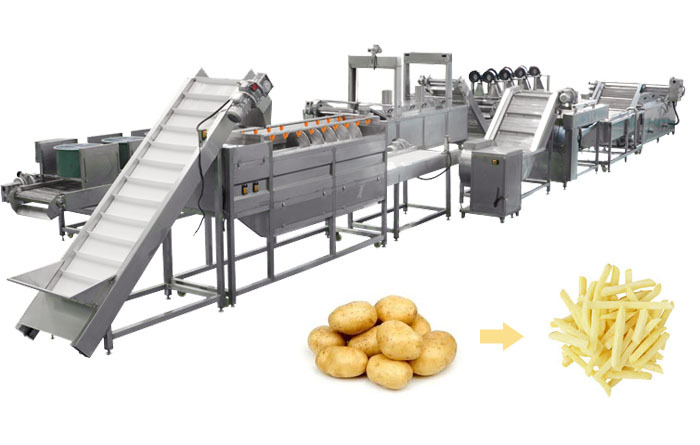 This potato french fries production line is automatic from feeding to discharge. It will save labor and realize the automatic. 6. 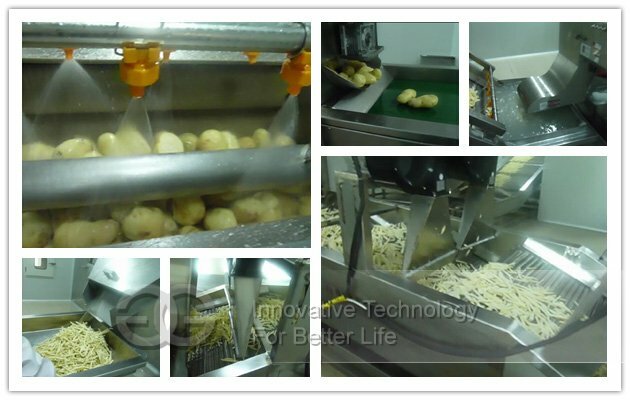 For Blanching Machine of french fries production line, it is automatic to control the temperature, automatic feeding and automatic discharging.